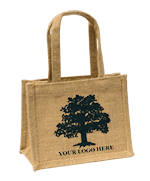 Our small jute mini bag is ideal for cosmetics & personal products, although we can think of many more uses for it like arts & crafts. Both cute & adorable - with a wide selection of colours to choose from - we are convinced your customers will love our jute mini bags too! "I was really delighted with the bags, in fact just thrilled. Most important to the actual goods is the service and contact that I have received from your company. The bags are the icing on the cake. Fabulous!" I have just received my first order. Lovely pink medium shopping bags. Ordering was easy and delivery prompt. I will be back for more thank you IslePac.